By now, you’ve heard the underdog story of new Blue Jays left fielder Kevin Pillar. Taken by Toronto in the 32nd round of the 2011 Draft out of Division II Cal State Dominguez Hills, Pillar set a new Division II all-time record with a 54-game hit streak. The West Hills, Calif., native anticipated getting drafted in a higher round, but signed regardless for a $1,000 bonus. Reporting to rookie ball as a 22-year-old, Pillar’s accomplishments at each of his minor league stops were constantly discounted because of his age, draft position or prospect stock. But everywhere he went, he kept hitting. “I think especially since just being a 32nd round draft pick, I’ve had the opportunity to surprise [the Blue Jays] with a lot of things,” he said. “It’s a chip that I carry on my shoulder all the time that I went that late in the draft. So how exactly did the 24-year-old get to where he is today? This is the story of Kevin Pillar. Sitting in an empty workroom at Florida Auto Exchange Stadium, new Dunedin Blue Jay Kevin Pillar sits comfortably in his chair, leaning back with a protein shake in his hand. Considering short-season affiliates play roughly 60 games per year, players can’t really afford a month-long slump to start the season, but that’s exactly what happened to Pillar. Over a month removed from his NCAA college season, Pillar hit just .253 and managed a .648 OPS in his first four weeks of pro ball. Unpleased with his batting average, Pillar became tired of seeing the figure posted on Bluefield’s scoreboard, so he requested that it be taken down from then on. Chris Maxwell, Bluefield’s general manager at the time, said that fans quickly became curious as to why Pillar was the only player to not have his average posted during at-bats. Perhaps that helped him turn a corner, but in addition to learning and incorporating a daily routine before every game, it was a connection with Graham that helped Pillar turn his season around. And perform he most certainly did. After hitting a pair of home runs and enjoying four multi-hit games at the end of July that year, Pillar’s 2011 season took off after August 1, when he hit .440 with a staggering 1.145 OPS over his final 28 regular season games. The late-season surge wound up boosting his batting average to a league-leading .347 mark, and earned him Appalachian League all-star honors. As a developmental league, however, not much can be said about rookie ball numbers. And at 22 years old, Pillar was one of the older players in the Appalachian League, and his success at the plate was discounted because of that fact. Looking beyond the numbers and working with Graham again, Pillar turned a key developmental corner in his time in Bluefield that made it clear he was ready to move up the following season. “I learned that a lot of pitches are away, and you’ve got to learn how to hit the ball away before you’re going to get pitches in,” Pillar said. “[Graham] really taught me how to drive the ball away and it opened up the whole field for me. Pillar didn’t have to wait until the following year for a promotion, as he caught a plane to Vancouver to join the Canadians in the thick of their Northwest League postseason run. Despite never playing a single regular season game in a Canadians uniform, Pillar played an integral role in the C’s winning their first League Championship. After losing the first game of the first round in a best-of-3 series, the Canadians were on the brink of elimination when Pillar arrived. After going 2-for-5 with a double, a stolen base, and two RBI in a Game 2 victory, Pillar repeated his performance in the tie-breaker, chipping in with a stolen base and another pair of hits as Vancouver hung on to win 5-4 and advance to the next round. In Game 1 of the Championship Round, Pillar went 3-for-4 with a towering home run to left field. He managed hits in each of the next two games, finishing his brief five-game stint with Vancouver 9-for-23 with five runs scored, four RBI and only two strikeouts. Opening the 2012 season with Class-A Lansing and getting his first taste of full-season baseball, Pillar discovered a familiar face when he set foot in the Lugnuts’ clubhouse for the first time. It was his former hitting coach Kenny Graham, who had moved up from Bluefield to become the new hitting coach in Lansing. For Pillar, that was just fine. The magic didn’t come right away, though, as Pillar, like he did in Bluefield, got off to a slow start in the Midwest League. He did knock six extra-base hits, but managed just a .668 OPS in his first month, including 18 strikeouts to seven walks in 22 games. But in addition to adjusting to a new league, a new team, and starting to play games at the beginning of April instead of mid-June, Pillar was working on another element of his game, something that he never really got a chance to touch while with Bluefield: baserunning. “Being an outfielder, I knew that [stealing bases] was part of my game. I always knew I could run,” Pillar said. “But it was something that I wanted to show off, that I was capable of stealing bases. I was fortunate in Lansing with [manager John Tamargo Jr.] that he was giving me the green light and I had opportunities to run a lot. The hard work over the off-season paid immediate dividends. 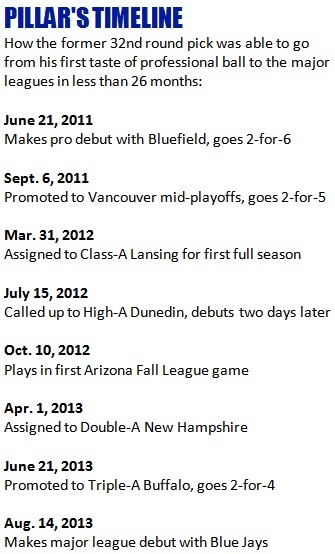 With only average speed but the ability to get good jumps on pitchers, there was Pillar, who had just eight stolen bases in pro ball to his name prior to the 2012 season, with 35 stolen bases in 41 attempts in just over three months with Lansing, good for an 85.4% success rate. It wasn’t just Pillar’s baserunning that came around, though, as the outfielder turned things around at the plate as well. Leaving his slow start in the rearview mirror, Pillar hit .344 with a .902 OPS in his final two-and-a-half months in a Lugnuts uniform. He refined his approach as well, as he drew 28 walks to 35 strikeouts in his final 64 games. Of those 64 contests, Pillar had two or more hits in 30 of them. “The better pitchers might throw harder, their sliders might be a little bit sharper, but control’s always a big issue,” Pillar said of Midwest League pitchers. Pillar’s most memorable game with the Lugnuts came on May 12, when he collected a career-high six hits. A special achievement in its own right, what made Pillar’s 6-for-6 night even more special was that he hit his first home run of the season—a two-out grand slam—in his final at-bat of the game. Having showed enough to earn a promotion, Pillar headed south to join the Dunedin Blue Jays in Florida to continue the next chapter of his minor league career, after leaving his mark on the stat sheet in the Midwest League. Despite playing only 86 games, he finished tied for seventh in the league in stolen bases and won League MVP honors. He finished with a .322/.390/.451 triple slash line, but despite the stats and the accolades his prospect stock remained low because he was still older for the level at the age of 23. According to his hitting coach, Pillar’s growth as a player made an impact as well. When Pillar arrived in Dunedin, he was still above the average age for the Florida State League, but not by nearly as much as his stints in lower levels. Nevertheless, the California native didn’t miss a beat following his promotion, as he went 4-for-4 with a double and a triple in only his fourth game with the D-Jays and hit .337 in his first month with his new team. Though his extra-base power trailed off in the final weeks of the season, Pillar finished with a .323 average in 42 regular season games with Dunedin, while going 16-for-19 in stolen base attempts. Pillar made hitting at a new level look easy, but it was more the astute observations and adjustments he made that allowed him to continue to succeed. “You’re hardly ever going to see the same pitch twice. If they throw you a fastball once in, the next pitch will more likely be away, and they’re commanding their off-speed pitches for strikes,” Pillar said of Florida State League pitchers. “I feel like the starters, especially, have added pitches to their repertoire. Instead of seeing two to three pitches out of a starter, you’re seeing minimum three to four maybe even a fifth pitch, which ultimately makes it harder. In the Midwest league you might see that starter twice maybe three times because of pitch count, here you’re going to see him three to four times. Fast forward to this past July, where Pillar is seen wearing the red alternate jersey of Triple-A Buffalo. It’s perfect summer weather. Alternative rock blares from the stadium speakers, and having just completed his turn in pre-game batting practice, Pillar comes and sits down in the Bisons’ dugout at Coca-Cola Field to discuss the whirlwind that has been his last 12 months. After wrapping up the 2012 regular season with Dunedin, Pillar flew across the country again, this time to Phoenix to be one of eight Blue Jays representatives in the Arizona Fall League. Playing for the Salt River Rafters, Pillar went 2-for-4 with a home run and stolen base in his first game, and eventually finished with a team-leading .371 average. Though the Fall League lasts for only six weeks and Pillar appeared in just 15 games, he said he took a lot away from his time there. Following nearly an entire calendar year of full-time baseball, Pillar enjoyed a brief winter of time off, which included celebrating his 24th birthday. But before long, it was time to report to spring training once again. It was during the spring when Pillar had an idea, one that involved his fiancée, Amanda Gulyas. It’s been said that the jump to Double-A is the hardest in all of minor league baseball, but Pillar didn’t exactly prove that’s the case when he settled in with the Fisher Cats. With his first full season under his belt and a better understanding of how to pace himself, Pillar exploded out of the gate with New Hampshire, hitting .330 with an .860 OPS in the month of April. It was a statement that Pillar had hoped for some time would occur. The numbers continued to roll in for Pillar, who quietly hit .313 with an .802 OPS in 71 games with the Fisher Cats. On top of 27 extra-base hits, Pillar added 15 stolen bases and struck out only 31 times in 327 plate appearances. Hitting second in the lineup for the first part of the season, Pillar had to unexpectedly tinker with his approach at the plate when Fisher Cats center fielder and leadoff hitter Kenny Wilson hit the disabled list at the end of April. As a result of his strong play with New Hampshire, Pillar was called up to Triple-A Buffalo on June 21. Now, as a late draft pick just one step away from the big leagues, Pillar drew the interest of local and national media outlets and was no longer under the radar. “I just keep doing my thing. I see it from time to time, my parents send it to me, they’re big on it,” Pillar said of the extra media attention he’s received. “It’s better for my friends at home and my parents, but I still have a lot of things that I want to accomplish and I’m still very motivated, despite maybe some of the praise or the attention that I’m starting to receive. It was with the extra media attention that reports came out mentioning that Pillar’s ceiling is only that of a fourth outfielder, and outside of maybe his hit tool, his other tools won’t play at the major league level. To the hitting coach that worked with Pillar from the beginning, that’s just fuel for the 24-year-old. “People underestimate his tools,” Graham said. “There’s nothing that jumps out at you and screams this or that, but the guy can play the game. He’s a very smart player. In Buffalo, Pillar was reunited with another coach that he connected with in his travels, as Bisons hitting coach Jon Nunnally worked with him when the two were recently in the Arizona Fall League together. In addition to helping him work on his defense in the outfield, specifically footwork and being in better positions to make throws and catch balls, Pillar said he just respects Nunnally’s knowledge of the game and his unique way of approaching the topic of mechanics. “It’s something that’s the next level with him; he’s more than just a hitting coach,” Pillar said. “There’s no aspect of the game that he doesn’t know very well. He’s good at helping hitters, especially young ones, make adjustments from at-bat to at-bat. Much like he did when he was promoted mid-season the previous year to Dunedin, Pillar was red-hot for his first few weeks with the Bisons. Nearly half of his 60 hits with Buffalo were for extra bases (19 doubles, four triples, four home runs) and he finished with a .299/.341/.493 slash line in 52 games. Baseball is a game of adjustments, and even though he had success, Pillar had to continue to make his fair share of them at the Triple-A level. “There’s no such thing as a fastball count anymore,” he said. “You’ve definitely got to be a little bit more selective, because you’re going to see a variety of pitches. A lot of these guys use cutters, which is a tough pitch, which I hadn’t seen a whole lot of before I got [to Triple-A]. Now having been promoted to Toronto, Pillar is playing left field and batting eighth; a switch from what he’s been used to this season. That’s fine by him, though, since he’ll just continue to take what’s thrown at him and be as versatile as he can.